It's quite a journey travelling from here to there. Surprises pop out or hide away, waiting to be found. There is something new around every bend and turn. Sometimes it's easy to be lost amongst the whirl and swirl of time. A trip down memory lane reminds us to stop and take a breath. Tommorrow will arrive soon enough. Leave the heavy baggage behind, pack light and enjoy the ride, take in the view. Once in a while a challenge might test the water, look up, a life line may be on the horizon. Tread carefully, slow down, appreciate the path and be grateful for the small unexpected sights. 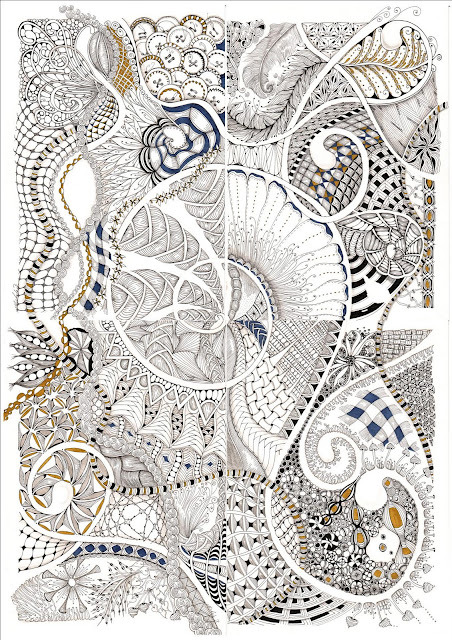 Life is full of surprises just like a Zentangle. beautifully said, Shelly! love the new look, too! Beautiful tiles and words Shelly !! I can see that your trip and adventure getting your CZT have inspired you. 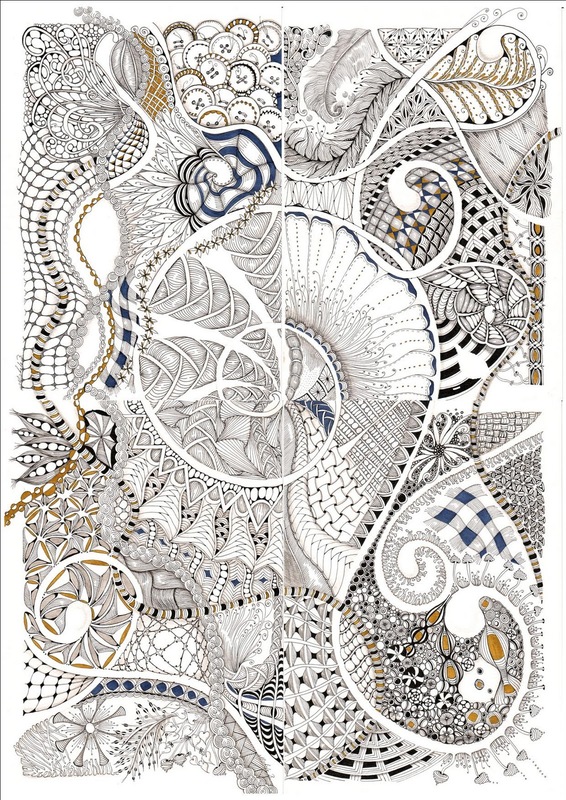 A 16 x 22 Zentangle is quite an adventure of its own! It's lovely. How long did it take? Oh my gosh! It is so beautiful I can hardly stop looking. What are you going to do with it? Gorgeous! Beautiful work and words! Oh wow! it's amaZing...! This will definitely be one of those art works you can look at for hours and see something different each time! It took me about 4 days on and off to complete. It's on the wall and will be for sale.